SolidStructural is designed as a convenient tool for Steel Detailing, Structural Design and Fabrication. In the family of 3D Steel integrated packages (such as SDS/2 or Tekla Xsteel) SolidStructural is the lowest price software, affordable for small companies or individuals. At the same time often the productivity and representation of drawings produced by SolidStructural is better. SolidStructural short learning curve and friendly interface lets new users become productive in a very short term. 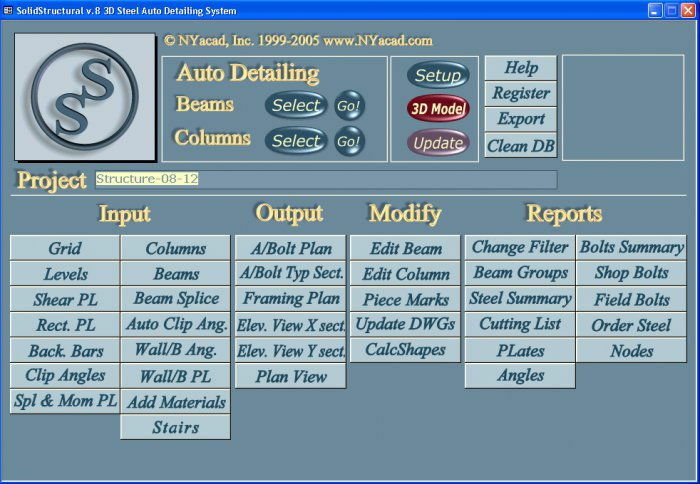 The users of this program generate precise 3D model and produce automatically the variety of structural and miscellaneous steel drawings: anchor bolt plans and details, erection plans, plan and elevation views, Shop Drawings of piece details, gather sheets, stair plans, elevations and detailed stringers. Reports in SolidStructural (Cutting List, Steel Summary, plates, angles, Steel Order and others) are always up to date. 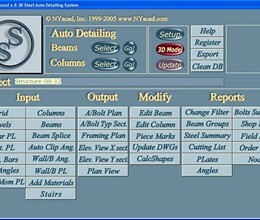 * SolidStructural download link provides demo version of the software. SolidStructural has been rated 2.0 out of 5 points. A total of 1 votes cast and 1 users reviewed the software.